Hand sculptured original Oreo biscuit clip on earrings for women or men. 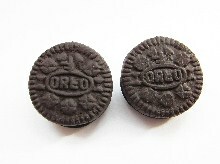 This cute pair of unique earrings comes with two 22mm Oreo pendants made from clay attached to two 15mm silver plated clip on leverback earrings. * Oreo biscuits might differ slightly in size and appearance due to being handmade.